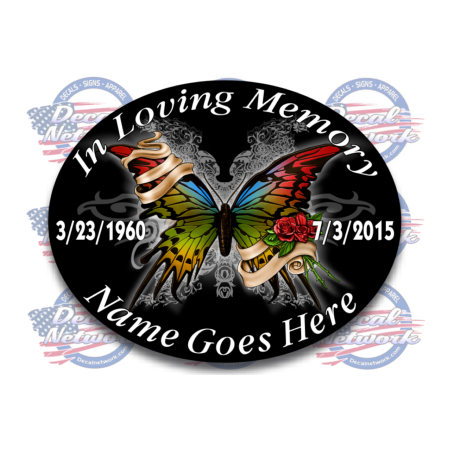 Minimum quantity for "Custom printed In Loving Memory Oval 4"x 5" decal Colorful Butterlfy" is 6. 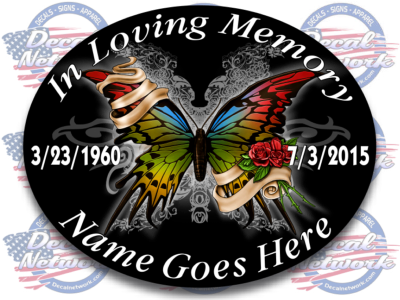 Custom printed high quality In Loving Memory decal full color with Butterfly theme. Printed on high quality vinyl material with UV inks and glossy clear laminated finish. Last for years outdoors. Easy to add your text input in boxes above. Size 4"x 5" Oval. Because this is a custom printed decal, there is a small min. order of 6 decals. Make sure to check out our other themes for this same size decal. Email us for request if you want a different theme you don't see here.